A court clerk is actually a fairly diverse job that has many demands. Court clerks need to be able to deal well with people in high stress situations and need to be extremely precise in all their dealings. Keeping up with paperwork is not an option for a court clerk; it is a necessity. Those that enjoy intense jobs in which they need to perform well every day may enjoy the position of a court clerk. Court clerks need to be extremely knowledgeable of the events that take place in a court, and thus require specialized legal knowledge to complete their work properly. The job of a court clerk is increasingly data driven, and demands that a court clerk be very savvy when it comes to the use of technology. According to information provided by the Bureau of Labor Statistics, a court clerk will make about $29,990 a year. While the job outlook is a little slower than average, it is still growing steadily. While a court clerk doesn’t necessarily need to have a college degree, it’s usually beneficial. The position can be somewhat competitive, as it only requires an applicant to have a high school degree or a G.E.D. Those that are interested in improving their odds at getting a position as a court clerk may consider an associate’s degree or a bachelor’s degree. An associate’s degree in criminal justice, legal studies or paralegal studies can all be considered applicable to a court clerk position and will benefit those that are interested in becoming a court clerk. There are many schools that offer these degrees, including community colleges, online schools and traditional four-year universities. A bachelor’s degree will be necessary for those that wish to work as a court clerk in a federal court system. 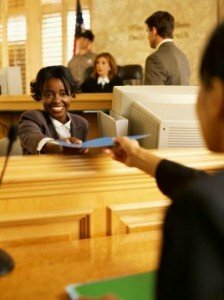 Entry-level court clerk positions often don’t require much; there is no training necessary for those that wish to become court clerks in small courts. This means that becoming a clerk in a smaller court is the ideal way to begin on a court clerk career path. As you progress through your career you will be offered better positions. Court clerks will not be able to progress pass a certain level if they don’t have the appropriate education and on-the-job training, which means that it is vital for those interested in becoming a court clerk and making it their profession to concentrate and do the best at their job. Court clerk internships are available for those that know they want to make being a court clerk their profession, and these internships can make it much easier for someone untrained to get their foot in the door. As noted by the United State Court System, there are certain citizenship requirements that are also applicable to becoming a court clerk in the federal law system, which is something that those that have more complex citizenship situations should consider. Those who are interested in being a court clerk can also consider becoming a paralegal, which is a similar position that also requires legal knowledge. Paralegals act as legal support, and in many times have a highly involved role in the justice system. Those that receive their degree in paralegal studies while pursuing a position as a court clerk will be able to easily transition between the two fields. While the fields are not identical, they are very similar, and paralegals in general make higher wages than court clerks, depending on where they work and the responsibilities of their position. Court reporting is also another similar position, though it requires some advanced training and the position does not deal with people as often.